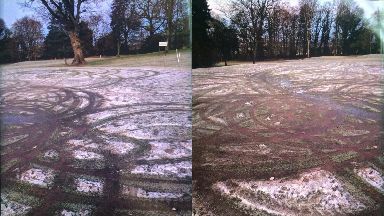 Staff discovered the damage to the grounds at Camperdown Golf Course on Tuesday morning. Vandals have destroyed part of a golf course by riding motorbikes on the green in Dundee. The culprits, thought to be riding motorbikes, left tyre marks across the first, third, fourth and ninth hole. The golf course is currently shut due to weather conditions. A Police Scotland spokesperson said: "Enquiries are being carried out after significant damage was caused to Camperdown Golf Course Dundee overnight. "Do you know who is responsible? Call 101 quoting 0608 of Feb 25." A Leisure & Culture Dundee spokesperson said: "We can confirm there has been extensive damage to Camperdown Golf Course. "As this is now a police matter, it would be inappropriate for us to comment further at this time although we would encourage anyone with information to contact Police Scotland."